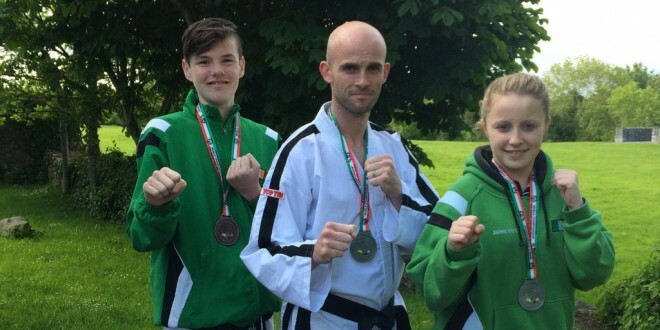 Three competitors from Quin Taekwon-Do club won medals at the world championships. Luke, Stephen and Joanne proudly display their medals. The Irish Taekwon-Do Team returned from the ITF World Championships in Jesolo, Italy with an impressive haul of five gold, six silver and five bronze medals, placing them fourth overall out of 60 countries. Among the Irish squad of 39 were three competitors from Quin Taekwon-Do club and each of them returned with a medal. Stephen Ryan, head instructor in Quin Taekwon-Do club was competing and coaching at the event and won the silver medal in 4th to 6th degree patterns, beating off opposition from Finland, Russia, New Zealand and Italy before narrowly missing out on the gold to his Canadian opponent, Maxime Bujold. The last time these two faced each other in the final was at the 2006 World Cup, with Maxime taking the decision on that occasion also. Stephen though feels his performances are only improving with age and experience, and will now reflect on whether to focus fully on coaching or to continue to compete at the top level. “The main thing for me at this stage of my career is that I enjoy competing, being in shape and training, yes it can be tough going at times trying to balance everything as well as coaching Joanne Potter, Luke Moriarty and the next crop of talent coming through, but I’ll take a few weeks off before deciding on my next goal,” he said. medal with the junior ladies team who put in very impressive displays against opponents from Canada, Russia and England before just missing the gold medal position to their New Zealand opponents. Joanne also competed in the power test event, finishing just outside the medals and in -60kg sparring where she comprehensively dispatched her first opponent from Romania before eventually losing out to the winner of the division from Slovenia in a very tough contest. Luke Moriarty, competing in his first world championships put in a very strong performance in the individual sparring -62kg division and also with the junior male team sparring before taking home the bronze medal in the team pattern event after some very strong displays of skill and precision. The trio from Quin now take a couple of weeks rest before preparing for the European Championships in Scotland in October. The other big news from the event is that Ireland has been chosen as the hosts of the 2017 ITF World Championships. The event will take place in Citywest Hotel and Conference centre Dublin and will attract 1,500 black belts from all over the world. Bringing the biggest event in the world to Ireland is a fantastic honour and wonderful opportunity; it will bring a great focus to the development of ITF Taekwon-Do in this country over the next two years.